Kick off your visit on the 1st (Mon): don't miss a visit to Plaza de Armas, admire the striking features of Santa Catalina Monastery, then explore the stunning scenery at Colca Canyon, and finally have some family-friendly fun at Patio del Ekeko. 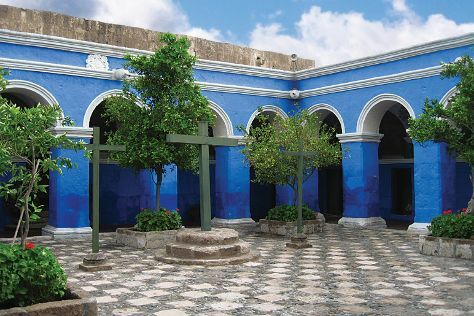 On the 2nd (Tue), you'll have a packed day of sightseeing: get engrossed in the history at Museo Santuarios Andinos, admire the striking features of Casa del Moral, then see the interesting displays at Monasterio de la Recoleta, then take in the architecture and atmosphere at Cathedral of Arequipa Museum, and finally contemplate the long history of Historic Centre of Arequipa. To find more things to do, ratings, and other tourist information, read our Arequipa trip itinerary maker. Lima to Arequipa is an approximately 2-hour flight. You can also take a bus; or drive. Traveling from Lima in May, Arequipa is little chillier at night with lows of 10°C. Finish up your sightseeing early on the 2nd (Tue) so you can travel to Cusco. Museum-lovers will get to explore Qorikancha and Museo Inka. Get a sense of the local culture at San Blas and Pre-Columbian Art Museum. You'll find plenty of places to visit near Cusco: Ceramicas Seminario (in Urubamba) and Archaeological Park Ollantaytambo (in Ollantaytambo). Next up on the itinerary: delve into the distant past at Sacsayhuaman, contemplate the long history of Sacred Valley of the Incas, admire the striking features of Catedral del Cuzco o Catedral Basilica de la Virgen de la Asuncion, and pause for some serene contemplation at The Company of Jesus Church. 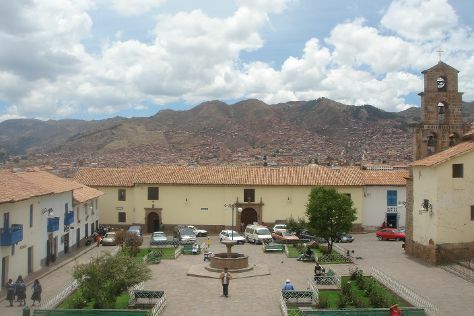 For photos, maps, where to stay, and tourist information, go to the Cusco travel itinerary planner. Getting from Arequipa to Cusco by flight takes about 1.5 hours. Other options: drive; or take a bus. Traveling from Arequipa in May, expect a bit cooler with lows of 4°C in Cusco. Wrap up your sightseeing by early afternoon on the 6th (Sat) to allow enough time to travel to Machu Picchu. On the 7th (Sun), take in nature's colorful creations at Los Jardines de Mandor, delve into the distant past at Machu Picchu, and then delve into the distant past at Intipuncu. On the next day, examine the collection at Museo de Sitio Manuel Chavez Ballon, then take in the awesome beauty at Putucusi Mountain, and then witness a stunning natural landmark at Banos Termales de Cocalmayo. For other places to visit, traveler tips, reviews, and tourist information, read our Machu Picchu vacation planner. You can take a train from Cusco to Machu Picchu in 4 hours. Another option is to drive. You will have some time to spend on the 9th (Tue) before leaving for Lima. Step out of the city life by going to El Silencio and Naplo. Do some cultural sightseeing at Miraflores and Huaca Pucllana. There's still lots to do: admire the landmark architecture of Iglesia y Convento de San Francisco, wander the streets of Barranco, take in the architecture and atmosphere at Cathedral of Lima, and admire the local landmark of Plaza de Armas (Plaza Mayor). For photos, other places to visit, more things to do, and tourist information, read Lima holiday planner. Traveling by combination of train and flight from Machu Picchu to Lima takes 6.5 hours. Alternatively, you can do a combination of car and flight; or do a combination of train and bus. In May, plan for daily highs up to 26°C, and evening lows to 20°C. Finish your sightseeing early on the 13th (Sat) to allow enough time to travel back home.